Handle several derived types include pointer, const, volatile, typedef and restrict. Definition at line 55 of file BTFDebug.h. Definition at line 40 of file BTFDebug.cpp. 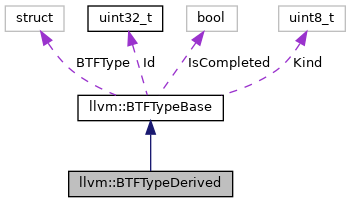 References llvm::BTFTypeBase::BTFType, llvm::BTF::CommonType::Info, llvm::BTFTypeBase::Kind, and llvm_unreachable. Definition at line 64 of file BTFDebug.cpp. References llvm::BTFDebug::addString(), assert(), llvm::BTFTypeBase::BTFType, llvm::DIType::getName(), llvm::BTFDebug::getTypeId(), llvm::BTFTypeBase::Kind, llvm::BTF::CommonType::NameOff, llvm::MDNode::resolve(), and llvm::BTF::CommonType::Type. Definition at line 79 of file BTFDebug.cpp.